Hi everyone, Steph Ackerman here today sharing how to upcycle a wreath into a new decoration. Who doesn’t have an old wreath laying around somewhere gathering dust? All you need is some ribbon and you can upcycle a wreath and make it like new. In just a few minutes you will have a beautiful wreath to fit any season at all! Place the Bow Wire in the Bowdabara and wrap it underneath so it is out of your way while creating your bows. Create a 3 looped bow from sheer red ribbon, twisting the ribbon on each pass through the channel. Use the bow wand to push the loops into the Bowdabra. Add a 2nd ribbon and create another 3 loop bow. Again, use the bow wand to push the loops into the Bowdabra. Pull up on the bow wire and tie off. Fluff out the loops. Next, remove the bow from the older wreath. Use the leftover bow wire to tie the new bow to the wreath. Next, add some daisies, giving your wreath a springy look. See how easy this was to upcycle and older wreath into something new and different? 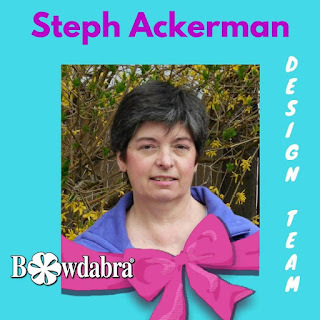 Check out Bowdabra blog each week as our design team is always coming up with amazing tutorials and video DIY’s. Also, be sure and click below to follow us on Facebook. Every Monday, at 7:00 p.m. EST and 4:00 p.m. PST, Sandy Sandler, the creator of Bowdabra will demonstrate several crafts in real time on Facebook Live. Every week one lucky viewer will receive a surprise gift. So mark your calendars!